I’ve mentioned Resturant Tang before as one of my absolute favorite places in Paris. I know a lot of his dishes, but on my last visit, he surprised me with this scallop and spicy soy sauce recipe. Scallops (Coquilles St Jacques, in French) are in season now here in France. It is rare to find a preparation of scallops that requires red wine and yet retains the taste of scallops. So many preparations of scallops drown the poor little things in bitterness (for instance a tomato sauce, à la Provencal) and you totally lose the sweet purity of the scallop flavor. This recipe is unique. The cooking time of the scallop is perfect, firm but not rubbery, warm but almost raw on the inside. It is served in its shell and topped with a delicate, spicy soy sauce that subdues the brunoise of chives and veggies. The scallop manages to hold its own. Even though soy sauce is powerful, this one still lets the scallops’ true, sweet nature express itself. Truly a brilliant and delicious dish. We drank a 2004 Clos du Marquis, one of the 2nd wines of Leoville Las Cases 2nd Grand Cru Classé in St Julien (Médoc). It was absolutely delicious with extraordinary mouth feel. Smooth ripe tannins with spices and red fruits. The pundits of this vintage say that it is a lesser vintage, but the 2004 red Bordeaux that I have had, I’ve always found a balance and spice that I very much enjoyed. Leoville Las Cases is a St Julien that is on the border next to Pauillac and actually abuts the Chateau de La Tour (1er Grand Cru Classé, Médoc). They are very serious about quality and in vintages that are less good or less reputed, they declass more wine into their 2nd wines in order to boost up quality across the line up. This is a sure bet 2nd wine. 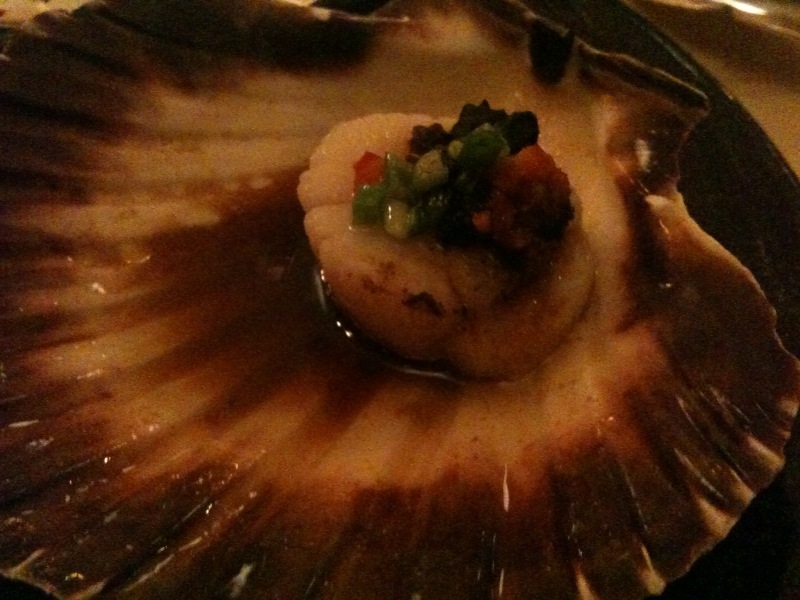 And it married perfectly with the scallop with its non-aggressive spiciness. A festival of spices on the palate. Previous Post Did I mention the 2009 beaujolais?